Around the same time Hurricane Florence made landfall in North Carolina, another dangerous tropical cyclone was wreaking havoc on the other side of the globe. On September 15, 2018, Super Typhoon Mangkhut tore through the northern Philippines, battering the country's most populous island of Luzon with destructive Category 5-level winds, 40-foot waves, and torrential rain. Known locally as "Ompong" in the Philippines, Mangkhut is the strongest storm seen on Earth so far in 2018. On September 12, Mangkhut was packing one-minute sustained of 180 mph (285 km/h), the Joint Typhoon Warning Center reported. Winds were only slightly lower, around 165 mph, as the storm made landfall in Cagayan Province, making Mangkhut the strongest storm to hit the Philippines since Typhoon Haiyan ravaged the island nation in 2013. News outlets said Mangkhut killed at least 60 people in the Philippines and four people in China after it slammed into southern China as a weaker, but still powerful storm. On September 16, Mangkhut lashed Hong Kong with 121 mph winds, the strongest typhoon to hit the city in nearly 40 years. 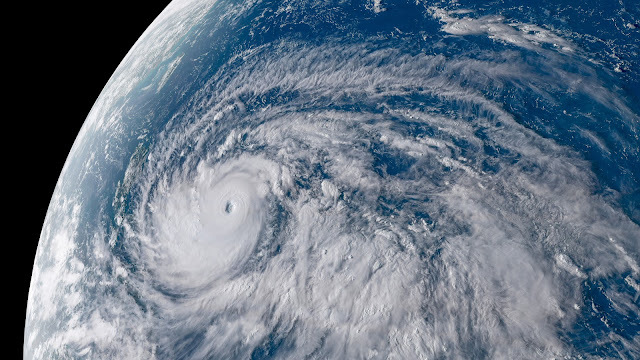 This visible satellite image from Japan's Himawari-8 geostationary satellite, shows Mangkhut on September 14 before the eye of the storm barreled through the northern Philippines.